The nation may be diving headlong into recession, but that's not stopping financial firms from a cherished year-end tradition: the awarding of bonuses. The number of bankers who will share the bonus pool has also decreased because of layoffs, the report found. The top executives will likely get paid "primarily in paper," meaning stocks and stock options, according to Alan Johnson of Johnson and Associates. Pay will be down, he said, but there will still be "thousands of people who make millions of dollars." In the report, he said, however, that "thanks in part to the financial bailouts and mergers we've seen recently, the decline in incentive payments won't be as drastic as first thought." To see Neel Kashkari field questions from a crowded room, one might think he's still being paid by Goldman Sachs rather than American taxpayers. The interim assistant secretary of the Treasury for financial stabilization yesterday had a tone of impatience during a question-and-answer session, leaving some attendees feeling cheated. When it came time for questions, the former Goldman Sachs executive told the eager audience that he had time for just "two or three." In response to the first question, about the government's latest lifeline for beleaguered insurance company American International Group, Kashkari gave a clipped response before quickly moving on. "This morning's action at AIG was a one-off event" that was necessary for the financial stability of the markets, he said. "He didn't say anything that I couldn't have learned from going to the Web site," griped one mortgage entrepreneur. Treasury spokeswoman Jennifer Zuccarelli said it's not unusual for public officials to answer a few questions before moving on. 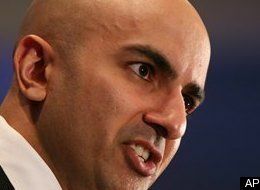 Kashkari's impatient tone comes amid a growing desire for openness about how government agencies, including the Treasury, are handling billions of taxpayer dollars being used to prop up Wall Street. Yesterday's news that the Treasury and Federal Reserve increased the size of American International Group's rescue to around $150 billion from $123 billion intensified concern that Uncle Sam isn't spending wisely. Meanwhile, Bloomberg News sued the Federal Reserve for information under the US Freedom of Information Act, claiming the Fed refuses to identify the recipients of almost $2 trillion of emergency loans as well as the troubled assets the bank is accepting as collateral. The more news that comes out about this thing, the worse it seems. It's important to remember that the those who strongly advocated passing this bailout weren't innocent bystanders caught up in a whirlwind, they knew what they were doing. They were giving 700 billion dollars to the Bush Administration's Treasury Secretary without any meaningful strings attached. And it's not like you needed news stories like these to know that it probably wasn't going to end well.